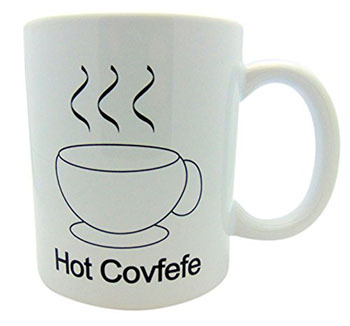 On May 31, 2017, the president tweeted “covfefe.” You’d expect a micro-industry to spring up around it immediately, which happened, but you might not expect to still be able to find Hot Covfefe coffee mugs, organic Covfefe lip balm, a Covfefe horror-movie poster, a wire Covfefe sculpture, a grammatically incorrect “Could Of” acronym, and a Covfefe christmas ornament in March 2018. They’ll sit on shelves, awaiting customers that have moved onto other, more timely mockery of the president, and will be discounted, purchased as on-sale gifts, maybe wholesaled, but will eventually wind up in the landfill. Americans generate around 600,000,000,000 pounds of solid waste (“trash”) a year, which works out to five pounds of landfill-bound trash, per person, per day. Whether this merch goes directly from the printing press to the mountain of garbage, or passes through a few hands before getting intermingled with K-Cups and other non-recyclable waste, its destiny is foretold. It’s tempting to think that one day in the future, someone wearing a silver jumpsuit will dig a Covfefe Mug out and marvel at what it must have been, but we both know better. No one will dig it up, no one will look at it ever again. The only way we’ll stop generating trash and piling it on top of other trash is when our species blinks out. From a material standpoint, if our species has a purpose, it is to dig up and cut down the Earth and form it into trash, then stomp it back down into the crust of the planet and dust our hands off. We could probably do it slightly less if we tried, which we won’t.